The RANCH Reporter Newsletter is Back!! The RANCH Reporter newsletter is back and includes lots of important information about our neighborhood including the status of the update of Clybourn Park, more about our Third Thursday concernt series, the ongoing upgrade of Privet Park, the wonderful work done at Anixter Center and a list of upcoming events including Tricks and Treats on Armitage Street on Sunday, October 30 from 11:00 a.m. to 2:00 p.m. The City of Chicago is working on plans to redevelop the Northbranch Corridor including the Finkl Steel site. Click here to see the materials from the city’s second community meeting regarding the issue. See the latest on the issue from DNA Info. Last year RANCH and Friends of the Parks teamed up to get Clybourn Park at 1755 N. Clybourn renovated. 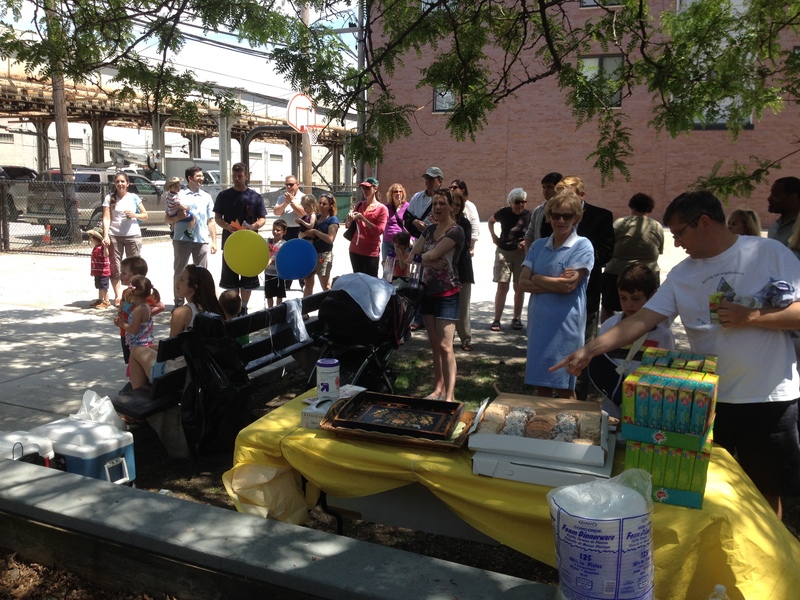 The work has been a huge success and Clybourn Park is once again an inviting oasis in our neighborhood. 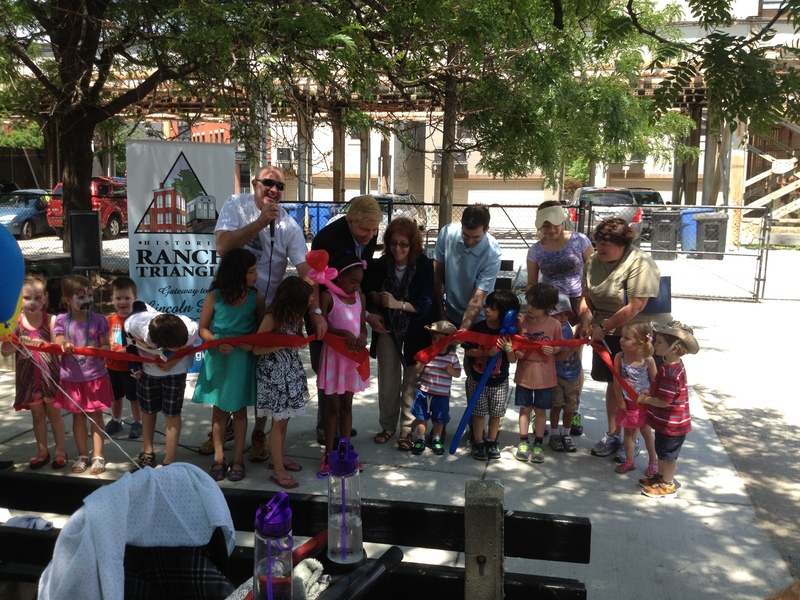 RANCH hosted the reopening celebration on Saturday, June 7 and it was a wonderful time. Thanks to Alderman Michele Smith, Alderman Scott Waguespack, and Alderman Bob Fioretti for attending and helping the neighborhood kids cut the ribbon to officially reopen Clybourn Park. Thanks to Amato’s Pizza, Chicago Bagel Authority, and Aldi’s for donating treats. RANCH Triangle is the 8th Most Walkable Neighborhood in Chicago – and a Walkers Paradise – According to Walk Score. At the recent RANCH community meeting, Adam Labkon of General Iron announced that General Iron would establish a community hotline for RANCH residents with complaints or questions. That hotline number is up and running and can be reached at 773-332-4379. Please call if you have a problem and remember that calling at the time of the problem or disturbance is a great way to isolate problems, notify General Iron and help everyone determine the cause of problems that may be coming from another local business. Our meeting was productive in other ways as well. Mr. Labkon shared the changes and investment General Iron has made recently in order for General Iron to be a better neighbor. Last summer they completed the installation of a “hood” to remove steam from their grinder rather than have the cloud dispersed over our neighborhood. They have also moved the dump area for deliveries to the north side of their property to reduce noise for RANCH residents. There is a question about the permissible noise level inside a manufacturing district. RANCH is working to clarify this issue. Aldermen Scott Waguespack, Bob Fioretti and Michele Smith were in attendance and were helpful in addressing the issue. We thank the alderman for the help. Thanks as well to everyone who helped make for a productive meeting. – There are several metal recycling businesses in that area. General Iron is only the largest. – In 2010 a long-term air quality study was done at the site of St. Josaphat, 2311 N. Southport Ave. The results of that study can be found here. – The leather tannery at the corner of Elston and Ashland is still in operation. Ald. Waguespack believes noxious odors that residents may experience are a result of this tannery rather than the metal recyclers. – The City of Chicago has closed the Department of the Environment. Those responsibilities have been spread across other city agencies. – The hours of operation for the General Iron shredder are 7 am to 7 pm. – General Iron has a permit from the EPA. That permit is a lifetime permit. – Ald. Waguespack shared that he thinks it’s very unlikely the city would eliminate the PMD (Planned Manuacturing District) that is currently shared by General Iron, Finkl, the other metal scrappers, and the other businesses on that stretch of the river. – General Iron accepts deliveries of recyclables 6 days a week. – The Illinois EPA inspects General Iron annually. We invited the IEPA to attend our meeting and received no response. – The city Department of Health visits General Iron monthly. – General Iron doesn’t crush cars. Cars arrive crushed, mostly for ease of transport, and are then shredded at the General Iron site. RANCH Triangle is now on Twitter. Follow us @RANCH_Triangle. Follow us and you’ll always know what’s going on in your neighborhood. Thank you to A. Finkl for its years of support and generosity in maintaining the planters on Armitage. However, with their move to the Southside, Finkl will no longer be able to provide the flowers and maintenance for this beloved Armitage institution. Therefore, RANCH needs your support to fill this void. Your donations will be used to help pay for the plantings and watering of the planter boxes in the summer and for the arrangements provided for the fall and winter months. Any donation is welcome and appreciated, and annual donations of $100.00 or more will be recognized on our yearly “donors” list. You can make your donations directly through this RANCH website (be sure to including “Planter Fund” in the memo section) or by mailing a check, payable to RANCH Triangle, to P.O. Box 1480, Chicago, IL 60614. If mailing a check, please indicate Planter Fund in the memo section of your check if you’d like your donation earmarked for our planter project. We appreciate your support and welcome your feedback on this and other issues. See our current donors. We thank them all!